Greg’s great great grandfather John Plowright (1831 – 1910) was born in King’s Lynn, Norfolk, on 26 November 1831. He was christened three days later in St Margaret’s Church. The church, now known as King’s Lynn Minster, is Grade 1 listed – a building of exceptional interest – in the register of the Historic Buildings and Monuments Commission for England. John was the fourth of eight children of William Plowright (1791 – 1869) and William’s second wife Sarah Ann Plowright nee Jackson (1796 – 1864). John’s father William was christened at St Margaret’s in 1791. 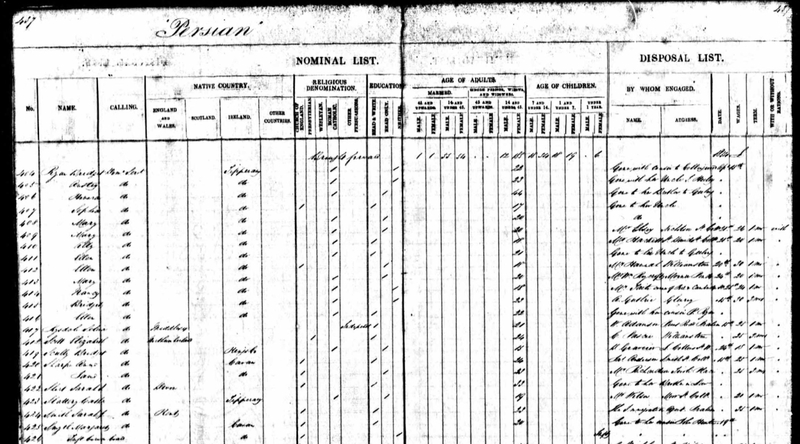 On the 1841 census William Plowright was living at Austin Street. His occupation is described as labourer; his wife was absent; and there were eight children aged from 2 to 20 living in the household. The oldest son, William, aged 20, was a plumber. William’s wife, Sarah Plowright, was a female servant in the household of John Ayre, a merchant living in Norfolk Street, Kings Lynn. In 1851, William, occupation seaman, Sarah, and three children and two lodgers were living at 22 North Clough Lane. Their son Edward aged 14 was a Boots at the inn. 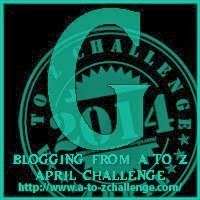 Frederick aged 12 was an errand boy, Mary Ann aged 8 was at school. John Plowright signed on as a merchant seaman in 1858. On the 1851 census he was living in Tower Hamlets, St Pauls Shadwell, in the East End of London. He was a boarder in a house with other seamen who were also boarders. About 1853 John Plowright sailed to Australia on the brig “Speculation”, probably as a seaman. He disembarked at Melbourne and joined the gold rush, never to return to England. Today 25th April in Australia it is is Anzac Day, set aside to honour the men and women who served in the Australian and New Zealand armies in World War I and II and other conflicts, especially in remembrance of those who were killed and never saw their country again. My husband’s first cousin twice removed was William Stanley Plowright (1893-1917). He was born in 1893 in St Kilda, a suburb of Melbourne, the seventh of the eleven children of William John Plowright (1859-1914), a policeman, and Harriet Jane Plowright nee Hosking (1861-1946). I have also written about a friend of his, ‘comrade of the late William Stanley Plowright’, named Johnna Bell, remembered by William’s family. 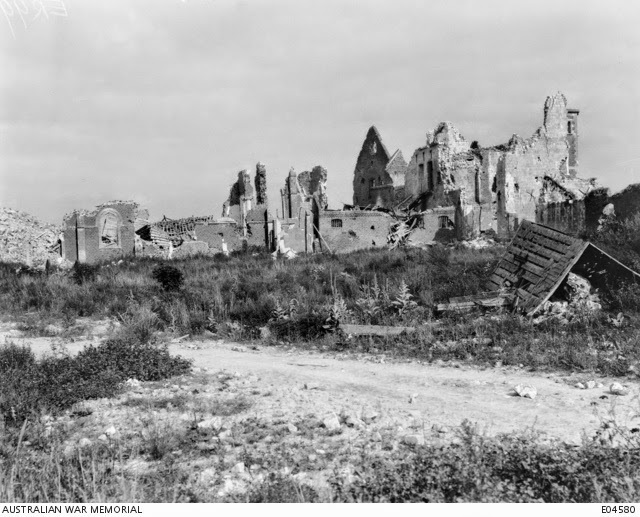 Australian War memorial photograph image id C00470. Photographer Ernest Charles Barnes, April 1917. 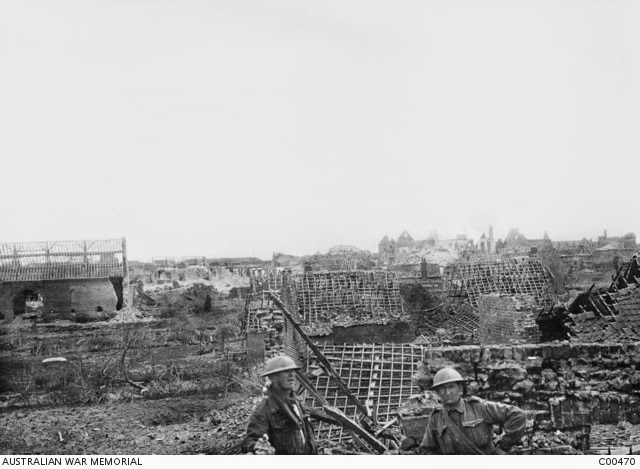 Description: Two unidentified soldiers stand amid the shattered buildings in the French village of Lagnicourt, which was captured by the Australians in late March 1917 as the Germans withdrew towards the Hindenburg Line. The Germans heavily shelled the village as they retreated. died of illness on 28 April 1916 in Colombo, Sri Lanka. He is remembered on the war memorial at Beaufort. Roll of Honour at the Australian War Memorial in Canberra. Photograph by Gerard4170 and published on pixabay.com. Ellen Murray (1837 – 1901) and Margaret Smyth (1834 – 1897), two of my husband’s great grandmothers, sailed from England to Melbourne, Victoria, on the Persian, arriving on 9 April 1854. Ellen’s sister Bridget and an infant surnamed Smyth traveled with them. The Persian left Southampton on 2 January 1854 with 448 government immigrants, of whom 200 were single women. Eight people died on the 97 day voyage and five babies were born. The Croesus, which sailed from Southampton more than a week after the Persian, arrived the same day. The Persian collided with another ship, the Cheshire Witch, in Port Phillip. Margaret Smyth was recorded as having given birth on board. She was from Cavan; her religion was Church of England; she could read and write; and she was 20 years old. She did not find a job immediately on landing, but went to stay with her cousin. 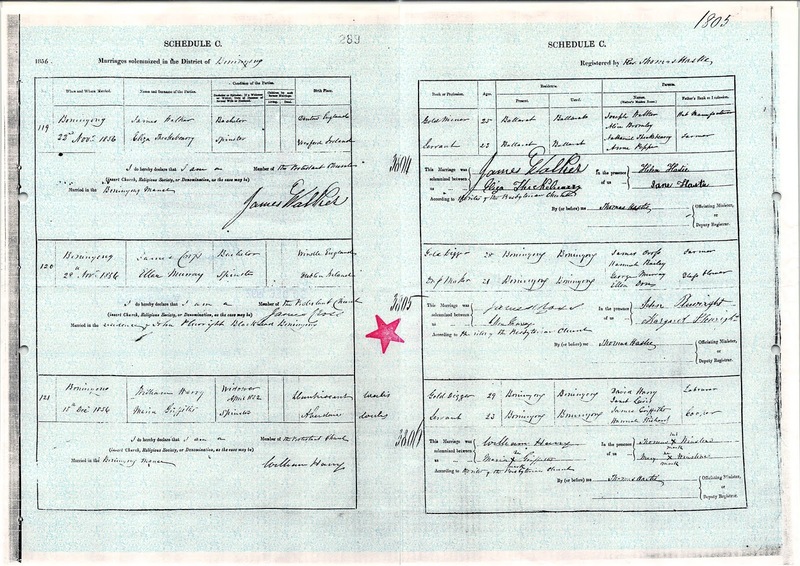 His name on the record appears to be ‘John Hunter’, though the surname is not clearly legible. I know nothing more about this cousin, nor have I have discovered anything more about Margaret’s baby. There seems to be no death certificate, but the baby may have died without its death registered, for in 1854 civil registration of deaths was not yet in force in Victoria. From the passenger list disposal summary Margaret Smyth and infant went to her cousin. On 19 November 1855 Margaret Smyth, dressmaker from Cavan, aged 22, married John Plowright, also 22, a gold digger. Their wedding was held at the residence of John Plowright, Magpie, Ballarat. On the certificate Margaret’s parents are given as William Smyth, farmer, and Mary nee Cox. 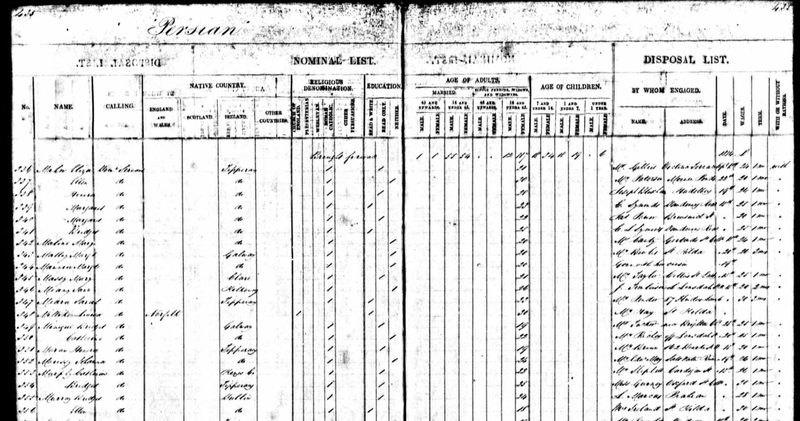 Passenger list from the Persian showing Bridget and Ellen Murray at the bottom of the image. Retrieved through ancestry.com (click to enlarge). Bridget and Ellen Murray were both from Dublin. Their religion was Catholic; both could read and Ellen could also write; Bridget was 24 and Ellen 18. Both found jobs on 15 April, within a week of their arrival. Bridget was engaged by S. Marcus of Prahran for a term of 1 month with a wage of 28 shillings and rations. Ellen was similarly employed by Mrs Ireland of St Kilda, with a wage of 30 shillings. I have not been able to find anything more about Bridget Murray. On 28 March 1856, two years after her arrival in the colony, Ellen Murray married James Cross, a gold digger, at Buninyong . Their wedding was at the residence of John Plowright, Black Lead Buninyong, in the presence of John and Margaret Plowright. Ellen gave her residence as Buninyong and her occupation as dressmaker. She was born in Dublin, aged 21, and her parents were George Murray, glass blower, and Ellen nee Dory. It seems that Margaret Smyth and Ellen Murray, who had emigrated to Victoria on the same ship, remained friends. Later the son of Ellen Cross nee Murray, Frederick James Cross, married Ann Jane Plowright, the daughter of Margaret Plowright nee Smyth. I think I have found a connection between the Hunter and Smyth families but I can’t link Margaret Smyth to it, at least not yet. On other certificates Margaret Smyth states she was born in Bailieborough, County Cavan. I found a John Hunter associated with Bailieborough. I have not been able to find a death of this John Hunter. 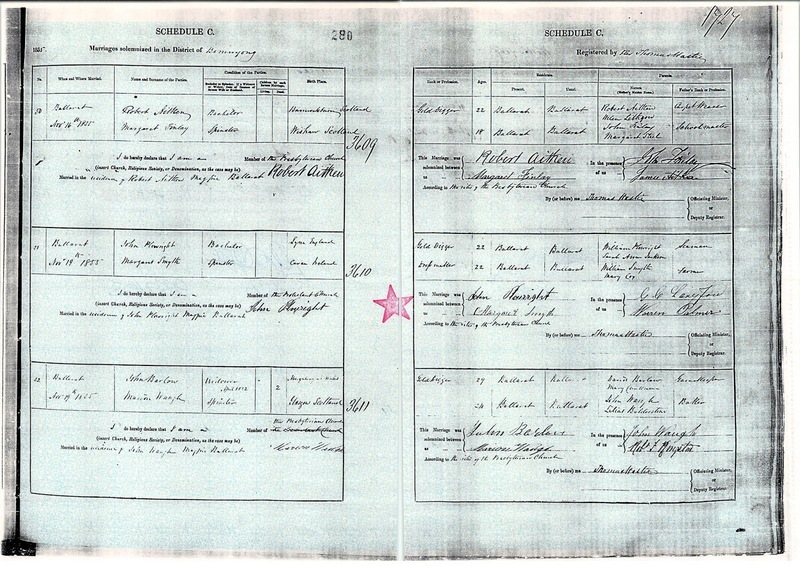 I ordered the marriage certificate and discovered Elizabeth Grace Hunter, age 27 had been born in Bailieborough. Her parents were John Hunter and Eliza Hunter nee Carmichael. I ordered her 1897 death certificate and found Elizabeth had been in the colony 34 years. 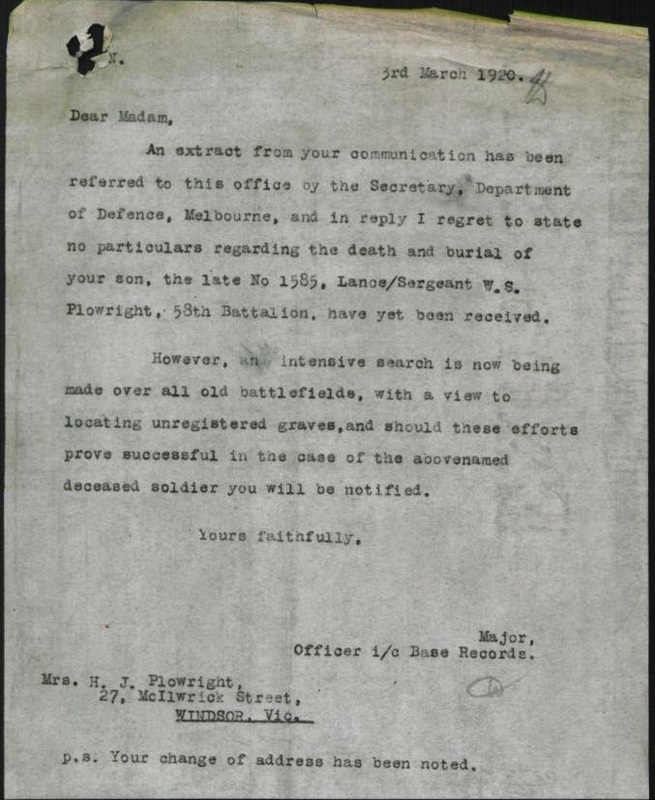 The informant on her death certificate was Charles Smyth, nephew, of Albury, New South Wales. I found H. Hunter on the death indexes. He was Henry Hunter who died 1875. 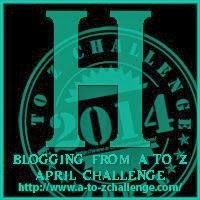 Henry was Elizabeth’s brother, also the son of John Hunter and Eliza Carmichael. I hope further research will uncover the connection and I can learn more about Margaret Smyth’s family. William John Plowright (1859-1914) was my husband’s great grand uncle, the oldest son of John Plowright (1831-1910) and Margaret Plowright née Smyth (1834-1897). The Avoca Mail reported on a mining accident where William Plowright dislocated his ankle and broke the extreme end of the small bone of the leg. He was nearly killed. William married Harriet Hosking in 1881. At the time of the accident, they had two children, both born at Homebush near Avoca in central Victoria. They had another child, also born at Homebush in 1885, when their fourth child was born in 1886 they had moved to Melbourne. It appears after the accident William Plowright gave up mining and joined the police. 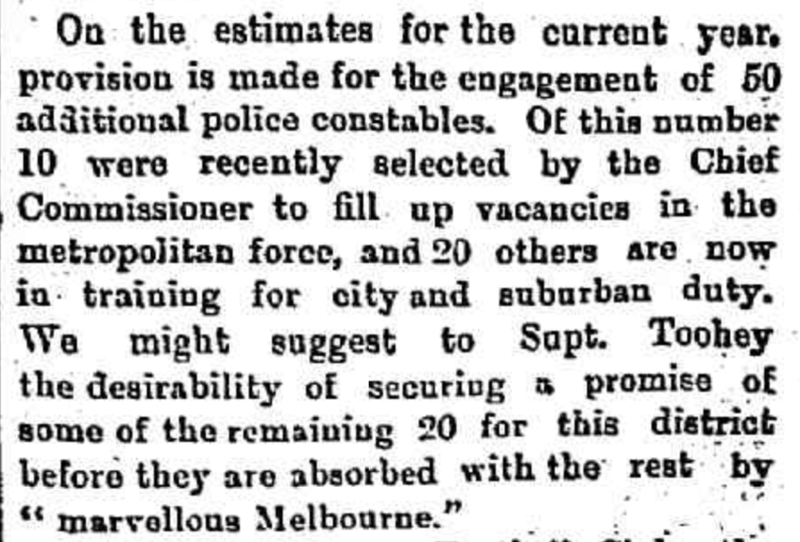 The Geelong Advertiser reported the recruitment of a number of new constables in October 1885. On 6 October 1885 William John Plowright was appointed a constable with the Victorian Police Force. 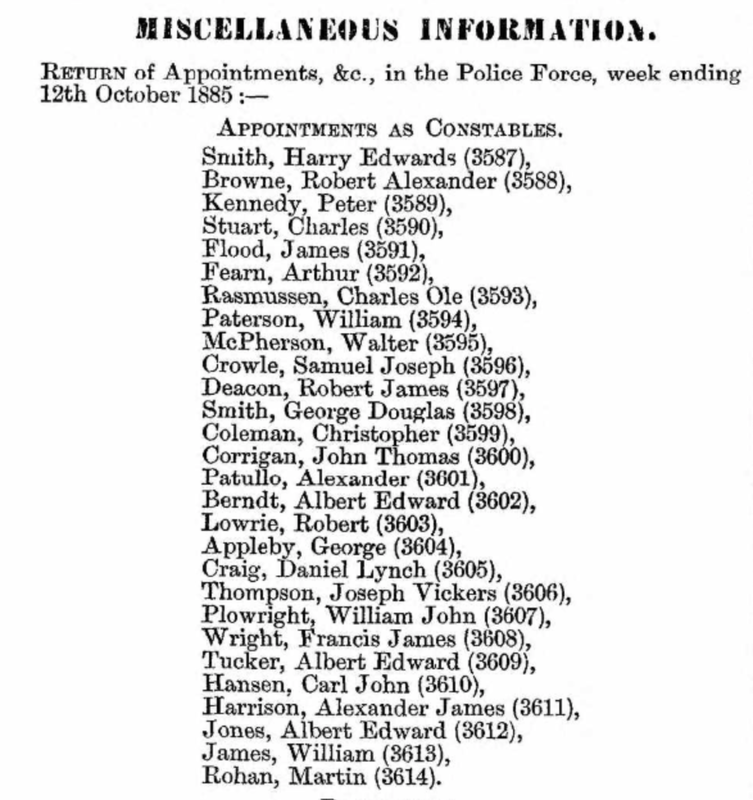 Constable Plowright was 26 years old. Fifteen years later, in 1901, he still held that position. His name appeared in the Police Gazettes for 1901, 1902, 1903 and 1904. Victoria, Australia, Police Gazette 14 October 1885 page 284 [database on-line]. Provo, UT, USA: Ancestry.com Operations, Inc., 2016. 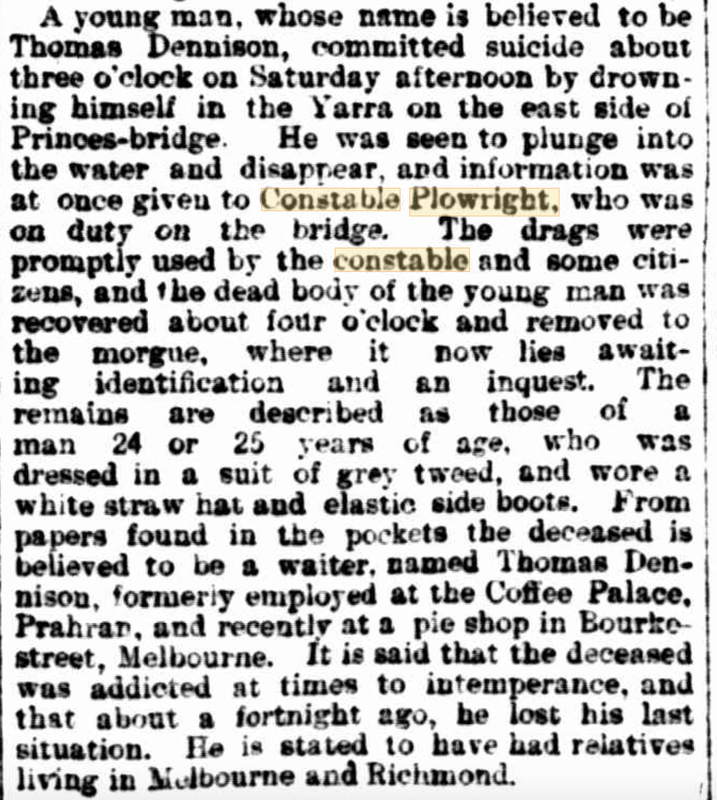 The first mention I found in the newspapers of Constable Plowright was in December 1885, on duty at Princes Bridge on the Yarra in Melbourne when a young man jumped off. 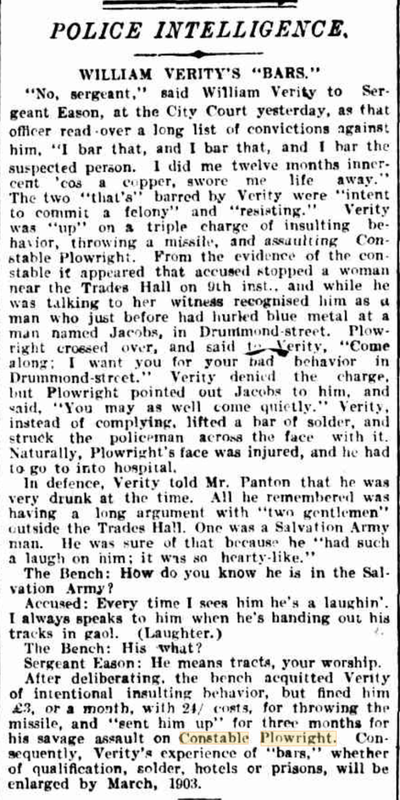 In 1888 Constable Plowright gave evidence in court about a fight in Clarendon Street. In 1889 he pursued and arrested three burglars in South Melbourne, apparently with the help of just one man, who was not a member of the police force. In March 1889, with another constable he arrested three boys who had escaped from a reformatory. Constable Plowright was regularly involved in various prosecutions under the liquor act, in particular Sunday trading offences. 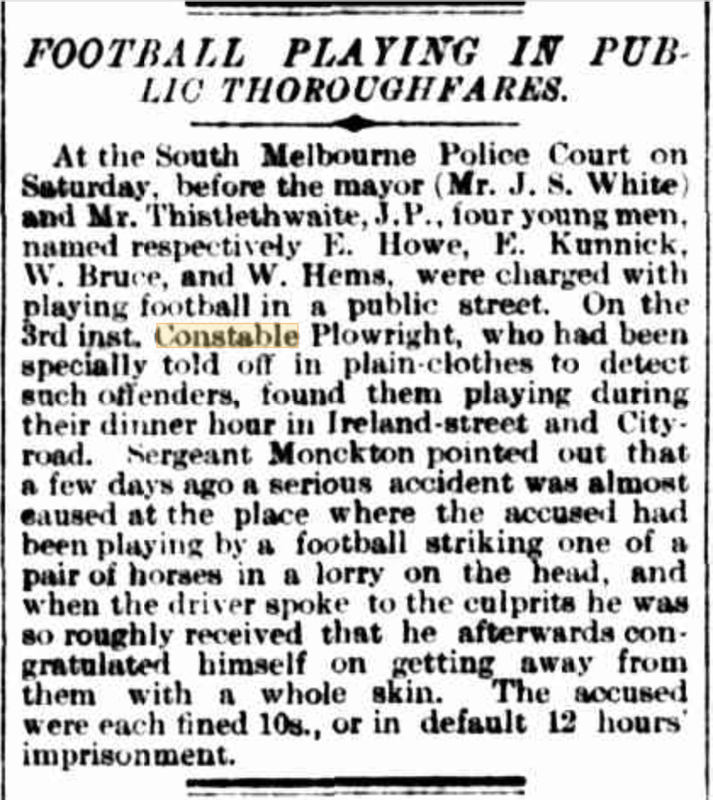 In 1891 Constable Plowright was working in a plainclothes position, still helping to enforce Sunday closing laws. He was also preventing young men from playing football in the street. In his work as a plainclothes constable, Plowright helped to arrest a gang of harness thieves. In early 1894 Constable Plowright applied to rejoin the uniformed branch. 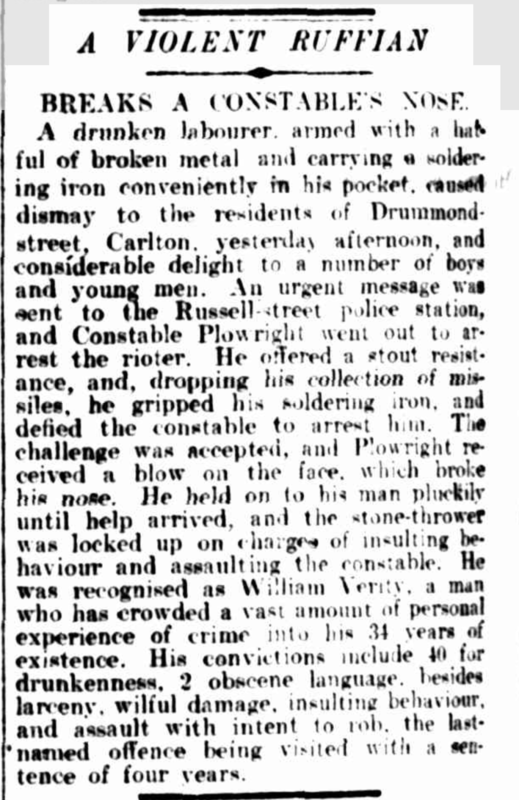 In 1902 Constable Plowright was assaulted by a drunk. This required several stitches to his wound. 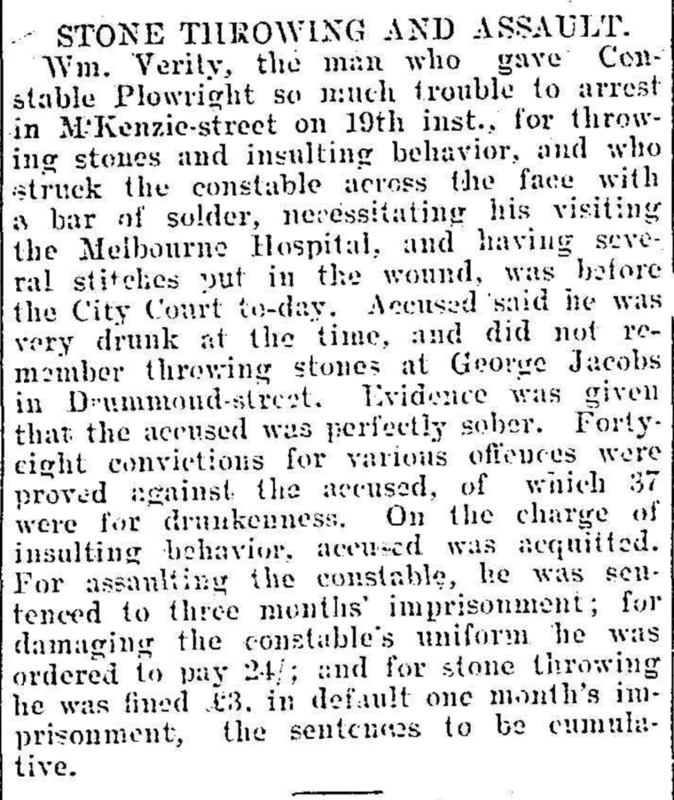 The Police Gazette of 3 March 1904, page 122, records that Constable William John, Plowright, number 3607, Melbourne District, was discharged 29 February 1904. This was shortly after his 45th birthday. The electoral roll of 1903 shows him living at 69 Argyle Street, St Kilda, with his occupation constable. 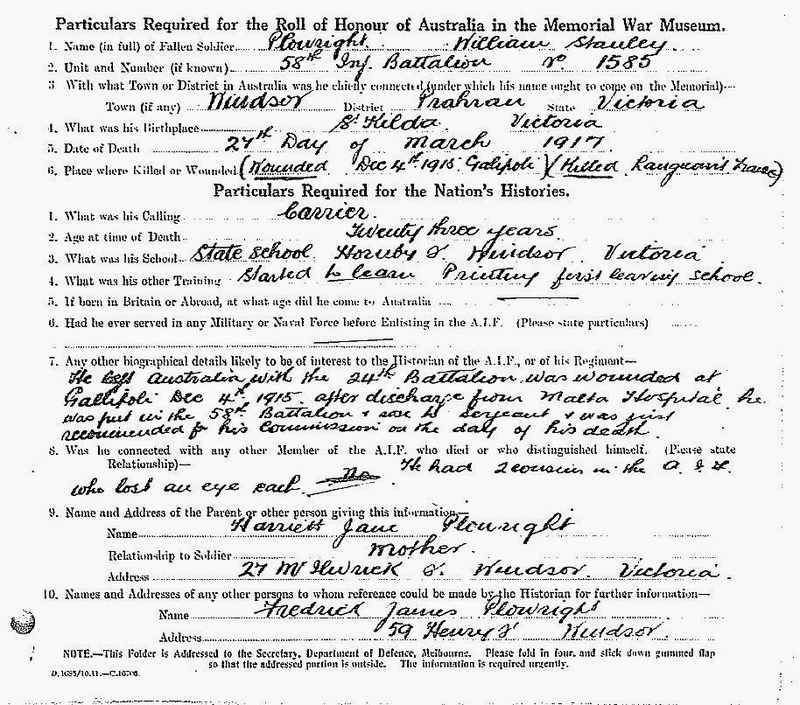 The roll of 1905 shows that he moved to 27 Hannover Street Prahran and his occupation is given as home duties. By the 1908 roll he was still living in Hannover Street, working as a wood merchant. It appears after he was he discharged from the police force he took a while to establish a new career. 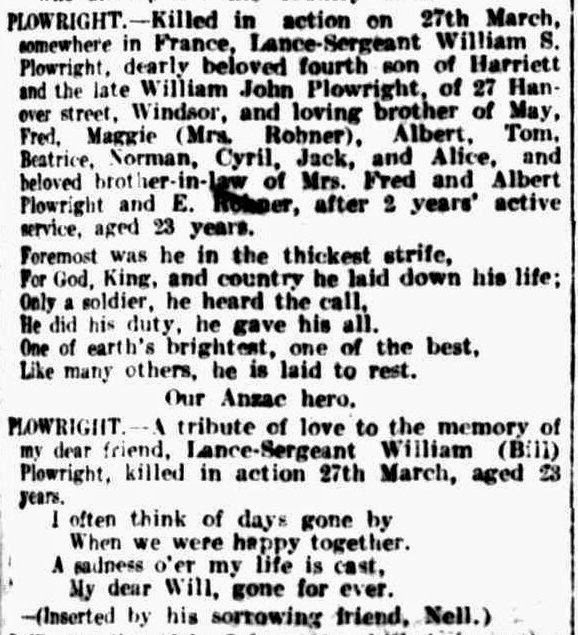 William John Plowright died on 29 May 1914 at the age of 55. Ancestry.com. Victoria, Australia, Police Gazettes, 1855, 1864-1924 [database on-line]. Provo, UT, USA: Ancestry.com Operations, Inc., 2016. Ancestry.com. Australia, Electoral Rolls, 1903-1980 [database on-line]. Provo, UT, USA: Ancestry.com Operations, Inc., 2010. Original data: Australian Electoral Commission. 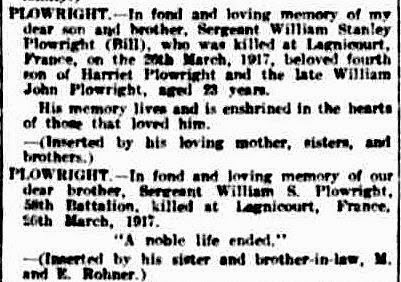 My husband’s paternal grandmother’s cousin William Stanley Plowright (1893-1917) died at Lagnicourt, France on 26 March 1917. 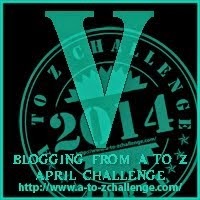 I wrote about William, his death and memorial in last year’s A to Z blogging challenge at V is for Villers-Bretonneux. Lagnicourt was 3 1/2 miles in front of the Hindenburg Line. The battle in which William was killed was a difficult fight but a notable battle and a success for the Australians. This battle was part of the Battle of Arras on the Western Front in April and May 1917. William was one of 160,000 casualties on the allied side and the Germans suffered 125,000 casualties. On the same day that William died, a Tasmanian, Percy Cherry (1895-1917), won a Victoria Cross at Lagnicourt. 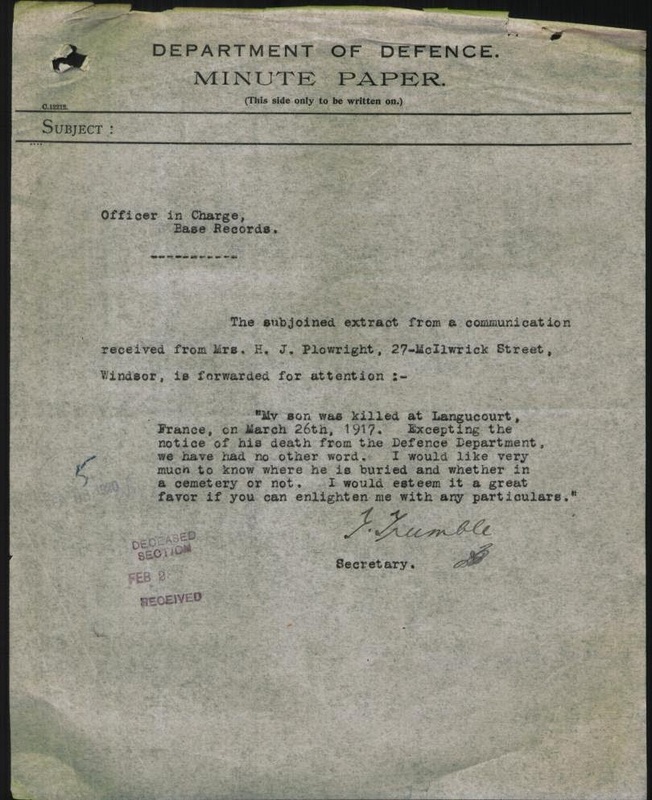 The award was granted posthumously for Cherry’s actions during an attack on the French village of Lagnicourt which was strongly defended by German forces. Cherry was with the 26th Battalion while William was with the 58th. Today the village of Lagnicourt is a farming community with a population of about 300. It was totally rebuilt after World War I. Before the war in 1911 the population of the village was about 575. It had been over 800 during much of the nineteenth century. 25 April is ANZAC day, a day to remember the Australians and New Zealanders who served their country in the armed forces. William Stanley Plowright (1893-1917) was my husband’s first cousin twice removed. He was killed in action at Lagnicourt on 27 March 1917 and is listed on the memorial at Villers-Bretonneux. 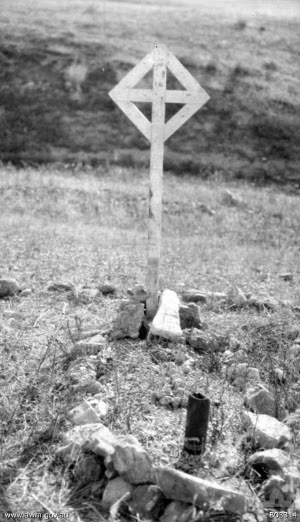 He has no known grave. Villers-Bretonneux, is a village in the Somme département of France, 16 kilometres east of Amiens on the straight main road to St Quentin. Villers-Bretonneux Military Cemetery is about 2 kilometres north of the village. Villers–Bretonneux Australian National Memorial lists the names of 10,762 soldiers of the Australian Imperial Force with no known grave who were killed between 1916, when Australian forces arrived in France and Belgium, and the end of fighting in 1918. Lagnicourt is south of Arras and north-east of Amiens and Villers-Bretonneux. The Battle of Lagnicourt was fought on 26 and 27 March 1917 as the Germans withdrew to the Hindenburg Line. William was the seventh of eleven children of William John Plowright (1859-1914) and Harriet Jane née Hosking (1861-1946). William’s brothers appear not to have enlisted. 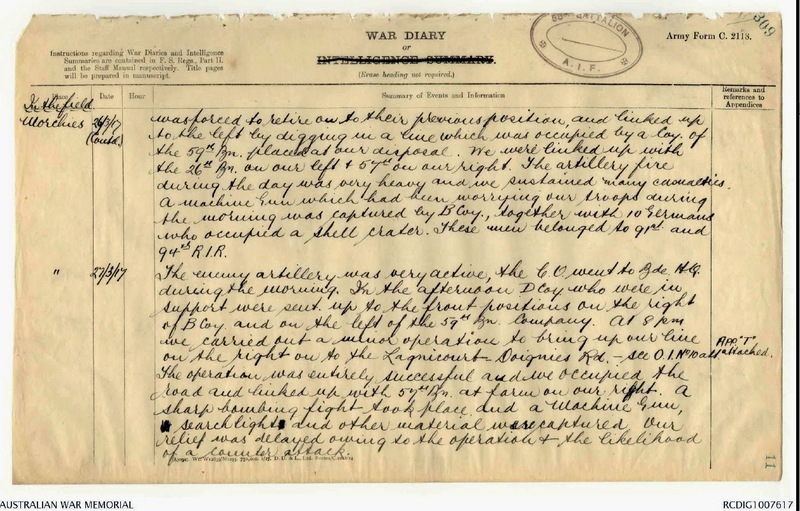 William enlisted on 5 April 1915. He was 21 years, nine months old and worked in Melbourne as a driver and a printer. On 25 June 1915 William embarked with the 24th battalion, 1st reinforcements on HMAT Ceramic A40 from Melbourne. He served at Gallipoli from 30 August 1915 and was wounded by shrapnel in action there on 29 November 1915. In April 1916 he was discharged from hospital on Malta and joined the 58th battalion. William was promoted to corporal on 12 November 1916 and appointed Lance Sergeant, acting sergeant, on 4 March 1917. The 58th Battalion participated in the Battle of Lagnicourt on 26 and 27 March. William Plowright was killed in action. I have not found any details of William Plowright’s death. His body was never found; quite possibly there was nothing left to find. He is one of the 10,762 soldiers who are listed with no known grave on the Villers-Bretonneux memorial. During the nineteenth century, many of my forebears and the forebears of my husband Greg lived in the Victorian goldfields area. There were several hospitals in the goldfields and their admission records have been preserved and indexed. 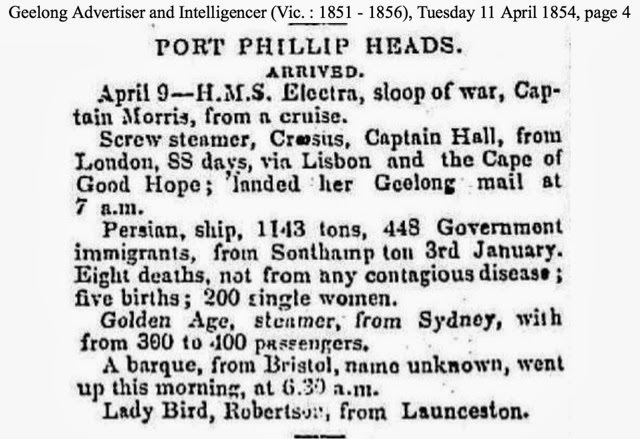 The indexes of the hospital records help answer some answers to family history questions such as on what ship the patient came to Australia. The Maryborough hospital collected information about port of embarkation, name of ship, number of years in colonies. Apparently this information was collected as part of a disease tracking program. On 5 March 1872 Margaret Plowright née Smyth, Greg’s great great grandmother, was admitted to Maryborough Hospital. According to the index of the hospital admission record, she was 37 years old, married, from Homebush, and a Wesleyan. She had arrived in the colony seventeen years previously on the Persian. The index does not tell us what her illness was. The passenger lists for the Persian are available at the Public Records Office of Victoria. However, with a common surname such as Smyth it is useful to confirm that we were looking at the immigration of the right woman. Margaret’s husband, John Plowright, came to Australia as a seaman and does not appear on any passenger list. However, when he was admitted to Maryborough Hospital in 1873, he stated he had been in the colony for 20 years arriving on the Speculation. His gave his occupation as mariner even though he had been a miner for 20 years. It is possible that the occupation was misheard by the clerk similar to the pirate / pilot confusion in The Pirates of Penzance. 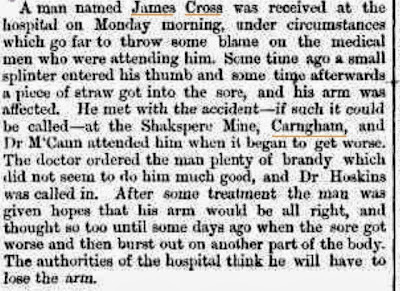 I have previously blogged about the hospital admission of another of Greg’s great great grandfathers, James Cross, who lost the use of a hand following the infection of a wound from a splinter. James was admitted to Ballarat Hospital in 1869. The hospital collected information about how long he had been in the colony, his age and his birthplace, but did not ask which ship he had arrived on. The index to the Victorian Goldfields Hospitals’ Admissions produced by the Genealogical Society of Victoria is available on microfiche and CD and has been purchased by many family history societies. The index is well worth exploring if your family lived on the goldfields. 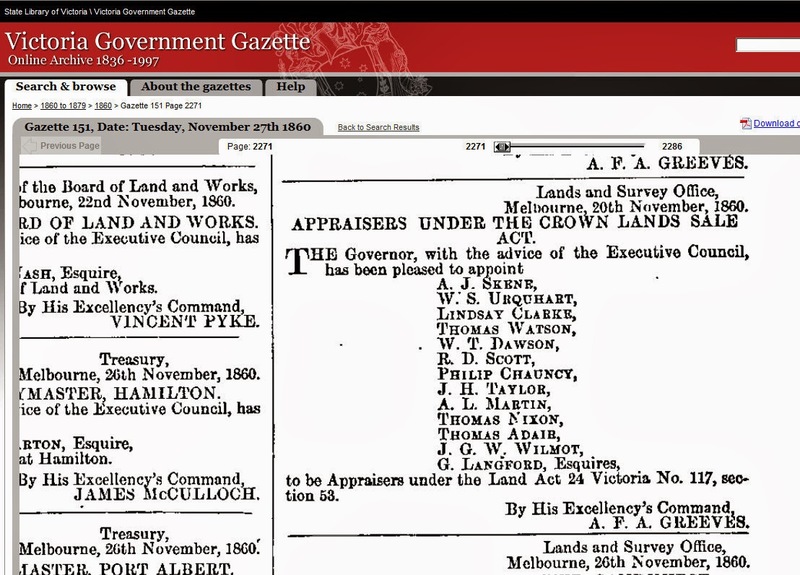 The Government Gazette has a wealth of information, everything from lost horses to land purchases or government employment. Some of this may be relevant to your family history. 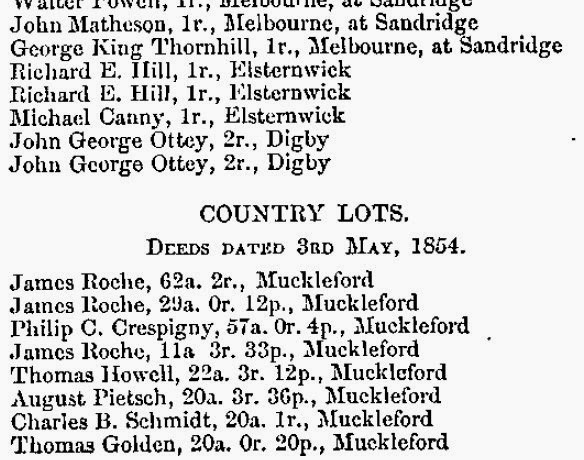 My husband’s great great grandfather, John Plowright (1831 – 1910), lost a horse in 1868. Without this advertisement we would not have known whether John Plowright had owned a horse. Unfortunately we don’t learn if he found it. I used the AUSTLII search and found my great great great grandfather Philip Crespigny land purchase. Government appointments were notified in the Gazette such as this one for another of my my great great great grandfathers, Philip Chauncy, who was a surveyor. Four weeks ago, the archivist and historian Shauna Hicks (http://www.shaunahicks.com.au) started a series of blog posts about genealogical records. There’s to be one post each week this year. I am a bit late to the party, but now I’m joining in. 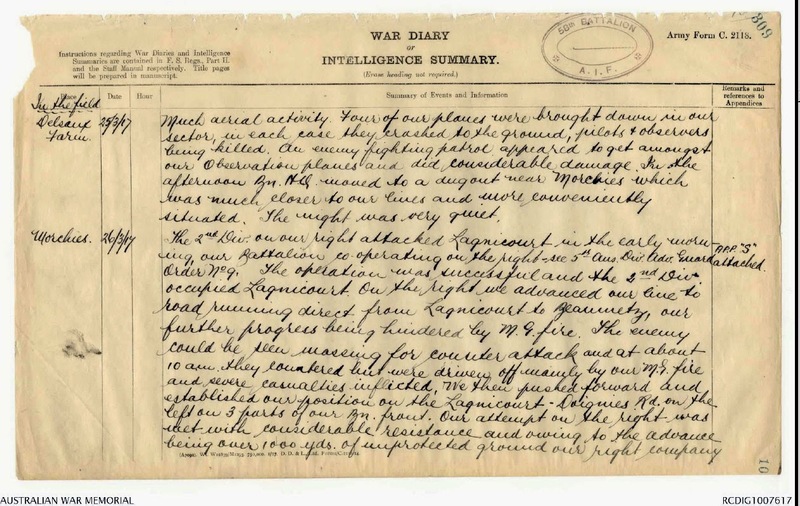 This week Shauna wrote about Memorial Cards (http://www.shaunahicks.com.au/52-weeks-of-genealogical-records-in-2014-week-4-memorial-cards/). 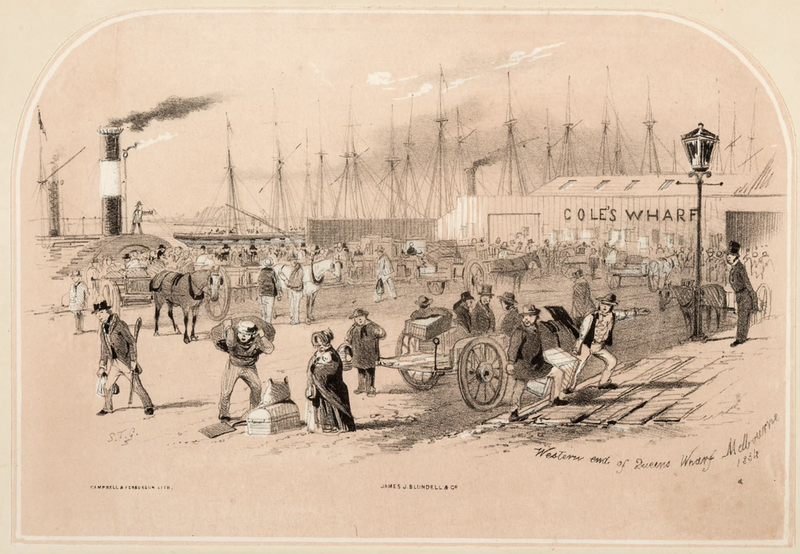 In 1854 Margaret Smyth, who became Margaret Plowright, arrived in Melbourne from Southampton on the Persian. She was 20 years old from County Cavan. During the passage to Australia, she gave birth to a boy, and when she arrived she first stayed with a cousin called John Hente. At least the surname looks like ‘Hente’ on the Assisted Migrant record; but the writing is hard to read and I have no other information about him. I would be grateful for any suggestions. In November 1855 Margaret married John Plowright, a goldminer, at Magpie near Ballarat. Their marriage certificate describes her as a 22 year old dressmaker from County Cavan, whose parents were William Smyth, a farmer, and Mary Cox. Margaret and John had seven children including one adopted child. I can find no mention of the boy who was born on the Persian. I have written previously on the marriage and children of Margaret and John. 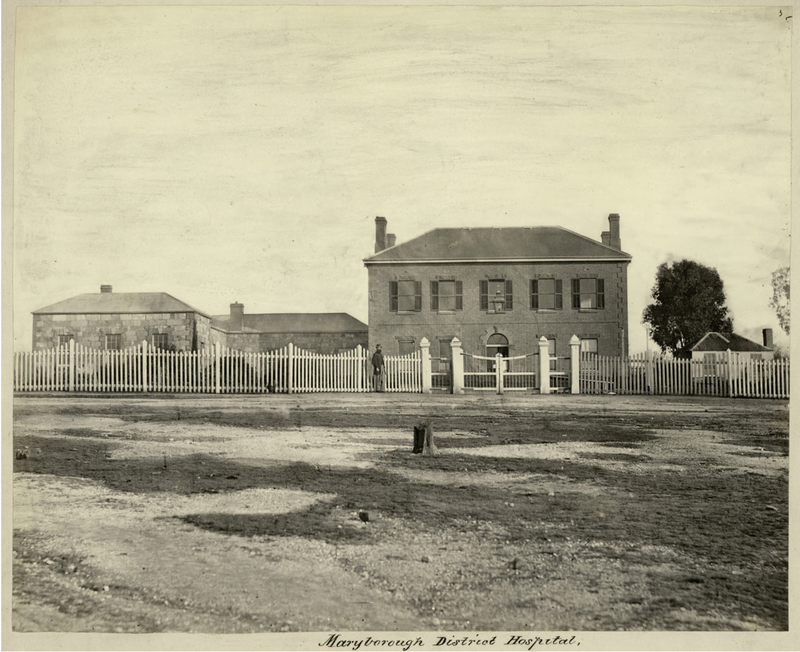 On 5 March 1872 Margaret was admitted to the Maryborough Hospital. According to the index of the hospital admission record, she was 37 years old, married, from Homebush, a Wesleyan, and she had arrived in the colony seventeen years previously on the Persian. In 1897 at the age of 63 Margaret died at Homebush near Avoca. The death certificate has the cause of death as Brights Disease [kidney failure], dropsy [fluid retention] and exhaustion. She was buried in Avoca cemetery.